The redesigned Continental GT is lighter, more powerful and more aggressively styled than its predecessor. Bentley is giving its third-generation Continental GT technology and performance upgrades to keep what has been its most critical nameplate from being overshadowed by the Bentayga SUV. The redesigned model is lighter, more powerful and more aggressively styled than its predecessor in a bid to attract a younger segment of the world's wealthiest car buyers. It rides on VW Group's new MSB platform, which also underpins Porsche's latest Panamera sedan. This chassis and a new aluminum body help the Continental GT shed 80 kg (176 pounds) from the previous generation. Bentley unveiled the third-generation model Tuesday ahead of its official debut at next month's Frankfurt auto show. The Continental GT has been crucial to Bentley's 21st-century resurgence, selling more than 66,000 copies since it was introduced in 2003. A continuous stream of variants -- V-8, convertible and high-performance -- have helped keep the car fresh throughout each generation; the second-gen model launched in 2011. 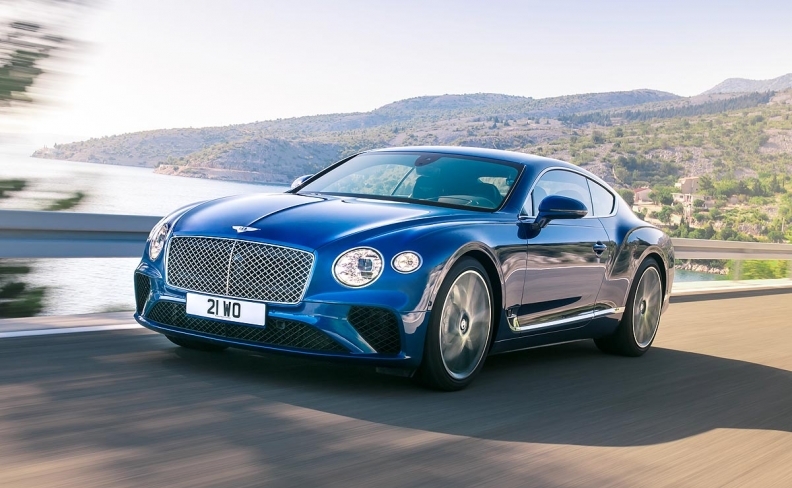 Yet with the recent release of the Bentayga, itself expected to be a volume player for Bentley, the third generation of the Continental GT doubled down on performance and technology. "The new Continental GT encapsulates our desire to innovate as well as celebrate our heritage and take the Bentley ownership experience to the next, unparalleled level," Bentley CEO Wolfgang Duerheimer said in a statement. The massive, 6.0-liter turbocharged W-12 engine is new to the Continental GT, and shared with the Bentayga. In the GT, it makes 626 hp and 900 Newnton meters (664 pounds-feet) of torque, a healthy increase from the earlier car's 582 hp and 531 pounds-feet of torque. The car's power is pushed to the wheels via a new active all-wheel-drive system that focuses on rear-wheel drive as much as possible, reducing the understeer common in awd systems. An eight-speed dual-clutch transmission is also new, replacing the earlier eight-speed automatic. The car also features an active air suspension. This Continental GT will accelerate from 0-100 kph in 3.7 seconds (0-60 mph in 3.6 seconds). Its top speed is 333 kph (207 mph), Bentley said. The sleek coupe gets an aluminum body that draws many of its design cues from the EXP 10 Speed 6 concept that debuted at the Geneva auto show in 2015. One set of headlights remains prominent, while the outward pair become smaller supplemental units. The taillights morph from soft rectangles into true ovals. Sharper lines in the body and a more aggressive coupe profile help the car look lighter and less cumbersome than its predecessors. Inside, the Continental GT offers a fully digital instrument cluster for the driver and a trick, three-way rotating dashboard display. 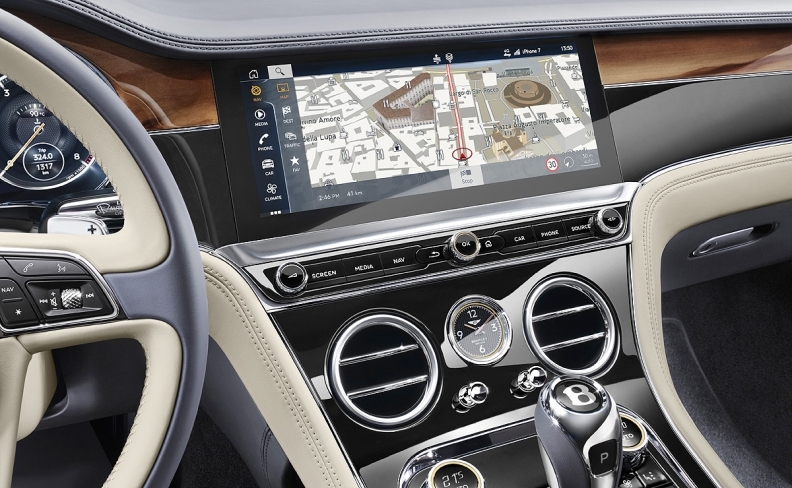 This optional feature sits in the center of the dashboard and can rotate at the touch of a button between a 12.3-inch high-resolution touch screen, a trio of analog gauges embedded into the wood veneers or nothing at all.